Dredd is clearly a movie that has been made by people who fully understand and respect the source material. This is by far the films strongest asset and helps carry the production through some of its short comings. It should also be noted that this is one of the most gritty and violent comic adaptation you're likely to see. It was rated R in the US went so far as to achieve an 18 certificate in the UK. The 3D process that accompanied the theatrical release and which is also available on the Blu-ray disc does add a rather sensationalist element to the proceedings with bullets passing through people’s faces in slow motion and blood spattering across the screen. Yet it works quite well and is reminiscent of Judge Dredd's origin on the luridly coloured pages of 2000 AD. As soon as the movie starts viewers are dragged into the decaying, overcrowded and squalid world of Mega-City One. Crime is rampant among the 800 million strong population and the Judges provide summary justice among the city's denizens. A new drug Slo-Mo is rife on the streets, with its reality slowing side effects. Judge Dredd (Karl Urban) along with rookie partner Judge Anderson (Olivia Thirby) investigate the source of the new narcotic. The trail leads to them to a two hundred storey tower block controlled by drug baron Ma-Ma (Lena Headey). After a violent confrontation begins, the judges face having to fight their way out through an army of criminals and killers. The story is simple and totally in accord with its central character. It is a very targeted production which after opening with establishing shots of Cape Town doubling as Mega-City One, becomes confined mainly to the tower block and surrounding locations. The production design by Mark Digby is very creative and certainly does as much as it can with the movies modest budget. Cinematographer Anthony Dod Mantle creates an interesting visual style by contrasting the overall decay and squalor with the beauty of the slow-motion scenes when people partake of the drug Slo-Mo. The visual effects are stylised and better than I was expecting. CGI violence seldom can compete with physical effects, but it mainly works within this production, suiting the required style. Alex Garland's script is minimalist and very much in the right idiom. As a result, we get a Judge Dredd who has little to say and remains somewhat of an enigma. The jury is still out as to whether he is an iconic old west style hero or an über fascist. Karl urban excels in the role and firmly keeps his helmet on, which will please the purists. For those looking for a greater character development, Olivia Thirby has somewhat more to do, but overall the narrative is lean on both plot and back story. One can argue that this is all that is required for such a movie, although I would point out that John Carpenter's Assault on Precinct 13 managed to explore similar themes with much more rounded protagonists. Pete Travis directs with confidence an does not shy away from the nature of the central character. The main reason the 1995 adaptation of Judge Dredd failed, was because it stripped away all the harsher elements of the plot and replaced them with humour, pathos and optimism. It also made the star the focus of the movie and not the character. You'll find none of that here. However, despite all its good points, Dredd does have areas of weakness. Some of the location shots in Cape Town are populated with contemporary vehicles and props that break the immersion. The use of slow motion in some of the action scenes does become a little repetitive at times. The opening narration could have been better and perhaps a little more back story on some of the characters would have been beneficial for narrative reasons. Also, through no fault of its own, the storyline of Dredd bares a similarity to the action movie The Raid, which was released earlier the same year. Sadly this stole some of its thunder. 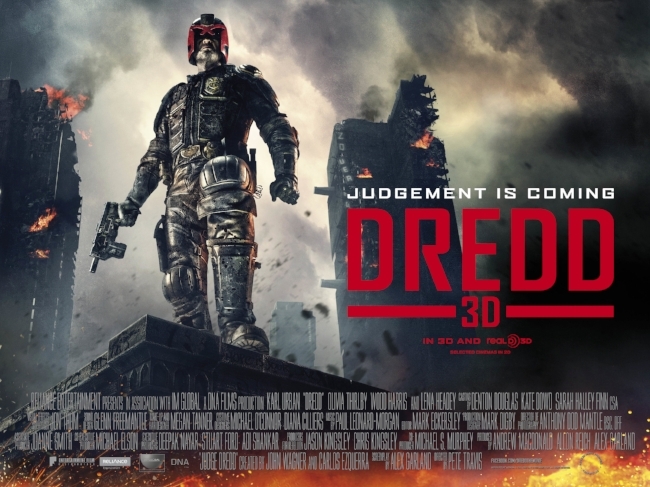 Ultimately, Dredd is a very solid action film and a rare example of a good comic adaptation. It sticks to its guns (no pun intended) and give the fan base what it wants. There was upon release and remains now, scope for a franchise, although to date this has not happened. As is stand Dredd is a commendable, honest and old school action movie that dares to buck the trend and go for a higher rating, rather than dilute its content in pursuit of wider commercial success. It once again proves that if you want to adapt a comic-based franchise successfully, you need to understand it fully and stay true to its core ethos. Hollywood take note. This is how it's done properly.